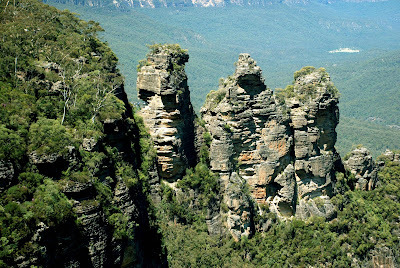 This is the picturesque and very famous rock formation called "Three Sisters" in the Blue Mountains of New South Wales, Australia. 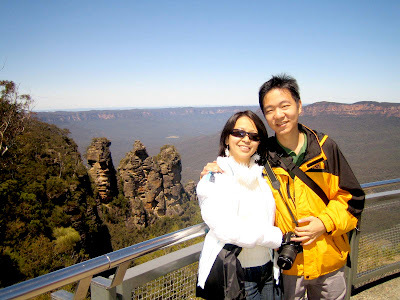 Towering above the Jamison Valley, the three rocks that were formed are called Meehni (922m), Wimlah (918m) and Gunnedoo (906m). The sisters were formed by erosion and other natural activities of our environment. But not everyone knows that there is a very interesting story behind this nature's wonder. According to legend, ages ago there were three sisters who fell in love with three brothers from another tribe. But marriage was forbidden by tribal law that led to a tribal battle. During the battle the father of three sisters asked an elder man or a witch doctor to protect them by temporarily turning them into stones. The elder man was killed during the fighting and no one could turn back the three sisters into life. No one can remove the spell so up to now, the three sisters are stuck. 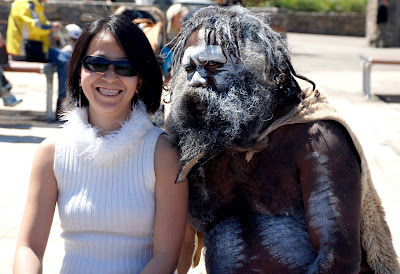 One of the few remaining authentic aborigines in Australia is sitting beside me in this picture. 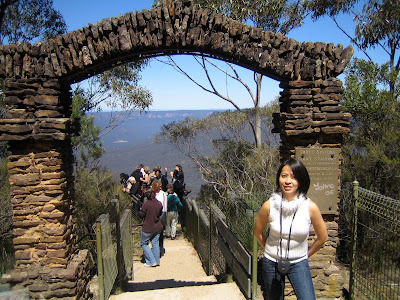 Some of them can be found in the Blue Mountains. It's funny that in this picture I am smiling but deep within me I am a bit scared because this man is whispering "Can I kiss you princess?". So I told my boyfriend to hurry up and click the camera. And by the way, we paid $2 Australian dollars just to have this picture. Though any amount would do. You will simply drop your coins in front of him. No coins dropped, no picture! With my photographer and partner in life. This is the trail going down to the viewing area. A good leg exercise! 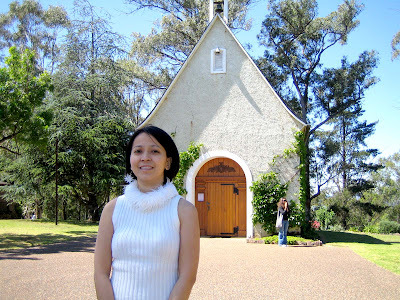 This is a very interesting petite chapel in the park of the Blue Mountains. I am a fan of small chapels. Yehey! 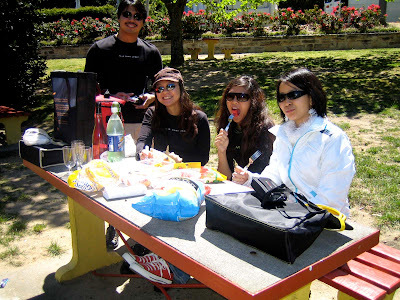 My favorite thing to do (and Aussies too) ... picnic! 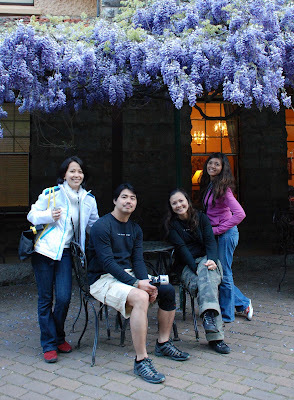 With my cousin Gary, wife Yonni and Yonni's sister Dewi! 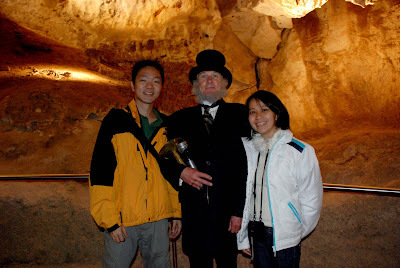 With us is John Lucas (an impersonator of the real one) and he's our tour guide inside Jenolan Caves. We went inside the most interesting cave in Jenolan which is the Lucas Cave, named after John Lucas. He was a local parliamentarian and was responsible for having the cave declared for protection. 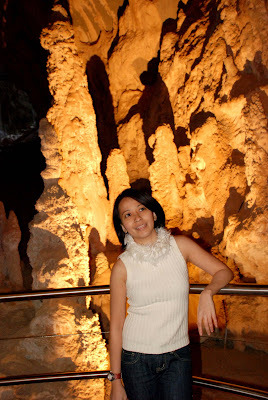 The Jenolan Caves is the home of precious limestones. 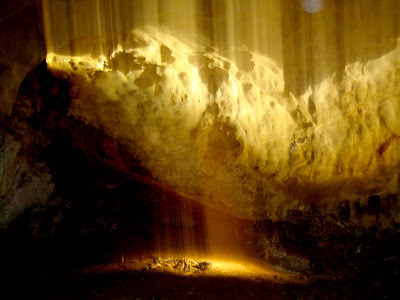 But in Lucas Cave there's this Cathedral, the highest chamber of this tour, and also the highest chamber of all Jenolan caves, 54m high. It is used for weddings and for concerts for example by Dame Joan Sutherland or the Vienna Boys Choir. Now and then, there are concerts in the hall. bakit ba nag-cocomment yang lotto na yan sa blog ni artist chef? para lng may masabi? at ipromote ang site.